Comparative View of the Principal Mountains and Rivers in the World. 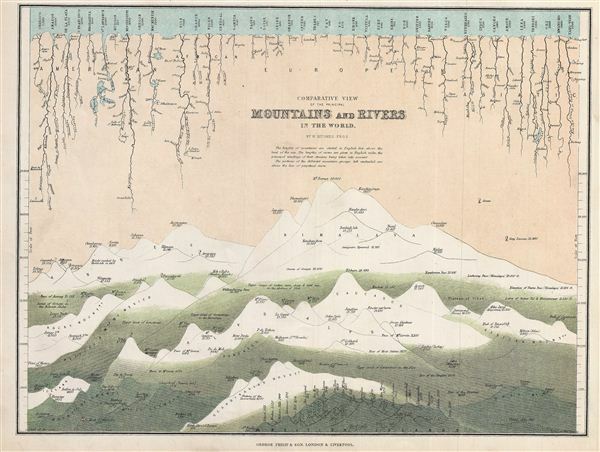 This is a fine example of George Philip's 1862 comparative view of the world's principal mountains and rivers. Details the world's great mountains divided according to mountain ranges, Himalayas, Alps, Andes, and so on, while principal rivers are grouped according to continent. When this chart was made, the highest peak in the Himalayan range, Mt. everest, is recorded to be 29,002 ft. (today it is recorded to be 29,029 ft.), the highest peak noted in the Andes is Aconcagua, in the Alps Mt. Blanc, in the Caucasus elburz, in the Rockies Mt. Brown. The longest river noted here is the Mississippi. Also notes important cities, falls, and lakes that the rivers flow through. This map was prepared by William Hughes F. R. G. S. and published by George Philip & Sons in 1862.